Dr. Clem Doxey was born and raised in Natchitoches, LA. He graduated with honors from Louisiana School of Medicine in 1962. He completed his internship at Oaknoll Naval Hospital in 1963 and graduated from Pensacola School of Medicine as a Flight Surgeon in 1963. After serving in the First Marine Brigade in Vietnam, he completed his dermatology residency at Tulane University in 1970. He founded Marietta Dermatology. 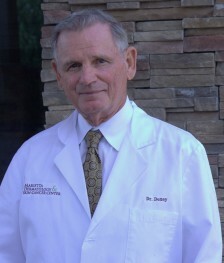 Dr. Doxey served as President of the Atlanta Dermatology Association in 1980, the Chief of Staff at Kennestone Hospital in 1986 and as the President of the N.A.C.D.S. from 2006-2007. He and his wife, Carolyn, have raised three children in Marietta.